"No one really explains to you taxes, and contracts, and how to chase a client for that bill that they owe you — like, the nitty-gritty," says P. Kim Bui, a freelance consultant. "It's just excruciatingly difficult to manage our finances," says P. Kim Bui, who has been a freelance consultant off and on for two years. In addition to the Web design and social media work she's hired to do, she must also manage all her own office functions, from accounting to payroll. 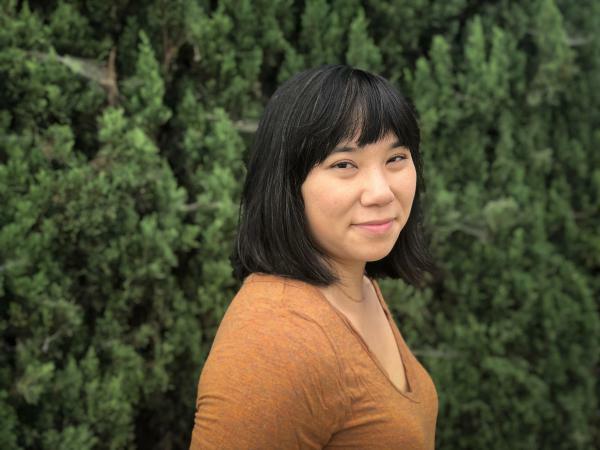 "No one really explains to you taxes and contracts and how to chase a client for that bill that they owe you — like, the nitty-gritty," says Bui, who lives in Los Angeles with her husband, who also works freelance, as a graphic designer. They are among the rapidly expanding population of contingent workers that make up, by some estimates, a third of the U.S. workforce. They, like others, enjoy the flexibility of that work arrangement. On the other hand, neither of them has an employer contributing toward Social Security, health insurance, retirement, or paid vacations. "There's no such thing as maternity leave for freelancers, so we've put off the kids conversation for a tiny bit," Bui says. She also functions as her own sales department, trying to keep clients in the pipeline, even as she works on other projects. She says figuring out what to charge for her time is a challenge in and of itself. "I actually just found out the other day, I'm still undercharging people," she says, based on what another freelancer told her they're charging for the same service. But simply charging more isn't an option for many freelancers, especially if they work in low-wage or very competitive fields. Gig work platforms, for example, make it easier to find work, but also increase competition among workers. "Freelancers are competing not just within their town, not just with in their state, but are competing globally, and there's just huge global pressures on the amount that they can earn," says Alastair Fitzpayne, executive director of the Aspen Institute's Future of Work Initiative. As the independent workforce grows and employers create fewer full-time positions, financial security is likely to become a bigger concern. An unpredictable income and a lack of benefits make it hard for solo workers to save, says Caitlin Pearce, executive director of the Freelancers Union. "Two-thirds of them are dipping into their savings every month to make ends meet. We see that freelancers as a result are really lagging behind employees when it comes to saving for retirement," Pearce says. Only 8 percent of self-employed workers save for retirement, compared to 42 percent of those with an employer, according to a Treasury Department study released last year. One problem is that solo workers bear a lot of risk for injury and illness, says Sara Horowitz, who founded the Freelancers Union. She left the group recently to start Trupo, a firm selling short-term disability insurance for freelancers. The service pays half their income for up to 3 months. Horowitz says many workers end up in the hole because they got sick, or were in an accident. "Because then they don't have the ability to work, they can't pay their rent, they end up having to borrow from friends, credit cards, and it just starts to snowball," she says. Another big barrier to savings is the complexity of taxes for independent workers. Traditional employers contribute toward their workers' payroll taxes, but that's not the case for the self-employed, who must pay all their own Social Security and Medicare taxes. And because taxes aren't automatically deducted from their paychecks, freelancers must figure out what they owe on their own. Duke Chang founded bSolo in part to ease that burden. BSolo's service automatically estimates and pays taxes. Without that, Chang says, it's hard for freelancers to know how much they can save. "They are hesitant to lock anything in, because they need the free cash flow in order to deal with taxes," he says. That's certainly true for Alex Patton. Last year, the 24-year-old contract chef and freelance writer in Atlanta discovered he was short on his tax bill by several hundred dollars. "I wasn't really prepared to fill out all the different paperwork and I ended up owing money because my freelance work didn't have taxes taken out of it," he says. Patton borrowed money from his parents and is trying to avoid falling into the same trap again. He says the financial stress has gotten to him, and he now wants to find full-time work. "I almost can't have fun anymore because there's always something that I should be doing — writing an article or finding a pitch," he says. There's a sharp debate in this country over the growth of the freelance or contract workforce, whether it's a good thing or not. Supporters say freelance workers have more control over when and where they put in their hours. Critics say companies are simply looking to avoid paying benefits and are creating a second-class workforce. However you look at it, being an independent worker does come with some unique challenges and headaches, as NPR's Yuki Noguchi reports. YUKI NOGUCHI, BYLINE: Kim Bui has been a freelance consultant off and on for two years and has learned this from the experience. KIM BUI: It's just excruciatingly difficult to manage our finances. NOGUCHI: In addition to the web design and social media work she's hired to do, Bui must also manage all her own office functions. BUI: No one really explains to you taxes and contracts and how to chase a client for that bill that they owe you, like, the nitty-gritty. NOGUCHI: Bui lives in Los Angeles with her husband who also works freelance as a graphic designer. They are among the rapidly expanding population of contingent workers that make up, by some estimates, a third of the U.S. workforce. They, like others, enjoy the flexibility of that work arrangement. On the other hand, neither of them has an employer contributing towards Social Security, health insurance, retirement or paid vacations. BUI: There's no such thing as maternity leave for freelancers. So we've put off the kids conversation for a tiny bit. NOGUCHI: She is also her own sales department, trying to keep clients in the pipeline. She says figuring out what to charge for her time is a challenge in and of itself. BUI: I actually just found out the other day I'm still undercharging people. NOGUCHI: Alastair Fitzpayne is executive director of The Aspen Institute's Future of Work Initiative. He says simply charging more isn't an option for many freelancers, especially if they work in low wage or very competitive fields. ALASTAIR FITZPAYNE: Freelancers are, you know, competing not just within their town, not just within their state but competing globally, and there's just huge global pressures on the amount that they can earn. NOGUCHI: As the independent workforce grows and employers create fewer full-time positions, financial security is likely to become a bigger concern. Caitlin Pearce is executive director of the Freelancers Union. She says income unpredictability and a lack of benefits make it hard for solo workers to save. CAITLIN PEARCE: Two-thirds of them are dipping into their savings every month to make ends meet. We see that freelancers as a result are really lagging behind employees when it comes to saving for retirement. NOGUCHI: Traditional employers contribute toward their workers' payroll taxes. That's not the case for the self-employed, who must pay both sides. And because taxes aren't automatically deducted from their paychecks, many must figure out what they owe on their own. Duke Chang founded bSolo in part to ease that burden. bSolo's service automatically estimates and pays taxes. Without that, Chang says, it's hard for freelancers to know how much they can save. DUKE CHANG: They are hesitant to lock anything in because they need the free cash flow in order to deal with taxes. NOGUCHI: That's certainly true for Alex Patton. Last year, the 24-year-old contract chef and freelance writer discovered he was short on his tax bill by several hundred dollars. ALEX PATTON: I wasn't really prepared to fill out all the different paperwork, and I ended up owing money because my freelance work didn't have taxes taken out of it. NOGUCHI: Patton borrowed money from his parents and is trying to avoid falling into the same trap again. PATTON: I almost can't have fun anymore because there's always something I should be doing, you know, writing an article or finding a pitch. NOGUCHI: He says, for him, the strain outweighs freelancing's benefits. Now he's looking for full-time employment. Yuki Noguchi, NPR News, Washington. Transcript provided by NPR, Copyright NPR.